Gruyere cheese and mushrooms were made to go together. With onions and garlic and a small dash of whole grain mustard, your nose would have flipped out last night as I was making this casserole. You’ve got your grain, protein, and vegetable all in one with this dish. Browsing through Heidi’s book, I saw a photo of this casserole and my mouth immediately started watering. Her photo is to die for and the chopped fresh tarragon makes all the difference. I was too cheap to go buy tarragon, one day I will have a giant herb garden and I can just tear off a tiny sprig to garnish my dishes. Until then, I’m ok neglecting the herb. 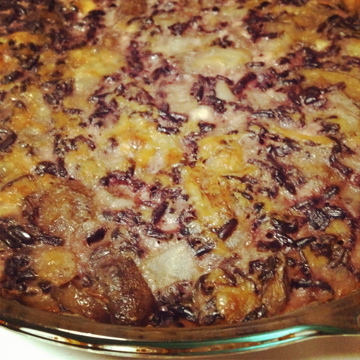 Also, my casserole turned purple from the wild rice. No big deal, it still tasted fantastic. I have not had that much experience cooking wild rice, and I can’t wait to experiment more. Two of us ate half of the casserole in one sitting, it was that good. Tonight’s dinner will be leftovers with some oven roasted broccoli. Cheers to healthy comfort foods! **NOTE: First, make sure that you have your rice cooked and ready before starting on the casserole. I used a combo of brown and wild rice, as Heidi recommends, to get “the creaminess of the brown rice playing off the individual wild rice grains.” Out of laziness efficiency, I threw 1/2 cup dry brown rice and 1/2 cup wild rice with roughly 2 1/2 cups water into my rice cooker. After an hour, both rices were ready. Granted my brown rice turned purple because of the wild rice bleeding its color, but it all got cooked and I was ready to begin the casserole. Make sure to take the top off of your rice cooker so that the rice has time to come to room temperature. Also, just for reference, brown rice is typically 1 part dry rice to just shy of 2 parts water. Wild rice is typically 1 part dry rice to 3 parts water. 1. Preheat oven to 350 degrees F. Rub a medium-large baking dish with a bit of butter or olive oil. I used a 9-inch pie pan and it worked great. 2. In a large bowl, whisk together the eggs, cottage cheese, sour cream, mustard, and a scant 1/2 teaspoon of salt. Set aside. 3. In a large skillet over high heat, combine the olive oil with a couple pinches of salt. Stir in the mushrooms. After the initial stirring, leave the mushrooms alone until they release their water and the water evaporates, about 5 minutes. Continue to cook and stir every couple minutes until the mushrooms are browned. Add the onion and cook until the onion is translucent, another 2 or 3 minutes. Stir in the garlic, cook for another minute, and remove from the heat. Add the rice to the skillet and stir until combined. 4. Add the rice mixture to the cottage cheese mixture, stir until well combined, and turn into the prepared baking dish. Sprinkle with two-thirds of the grated cheese and cover with aluminum foil, or in my case if you do not have aluminum foil, just place a baking sheet on top of your casserole dish. 5. Bake for 30 minutes. Remove the foil/baking sheet and bake for another 20-30 minutes, until the casserole takes on a lot of color. The finished casserole should be hot throughout and golden along the edges. Let it stand for a few minutes and then serve sprinkled with the chopped tarragon (if using) and the remaining grated cheese.